Abhijit Prabhudesai, 48, is an engineer who was part of the team that planned and executed the Dubai international airport. In 2002, he chucked up his job and returned to his native Goa to spend the rest of his life exploring nature. He found himself fighting the miners instead. "I began my nature search in the forests of Goa. In the process, I discovered huge moon-like craters in the middle of the forest! It wasn't sustained mining. I then met several tribals living in the interior. This set my agenda for years to come,'' recalls Prabhudesai. He first studied the entire issue. He even enrolled himself for a law degree. He studied law till the last semester and then didn't write the exam. "The idea was to know the law and not to take the law degree," he says. Prabhudesai found that the Indian map given to the UN did not show the Western Ghats in Goa. "The map shows the beginning of the Western Ghats in Maharashtra. They end where Goa's boundary starts. And then the ghat begins at the Karnataka-Goa border. This is shocking and absurd. It's a conspiracy to keep the veil on the pathetic condition of the Western Ghats in Goa," he says. 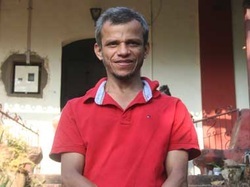 He adopted a village called Caurem in south Goa. The village is the worst affected by illegal mining, as four huge mines, including one operated by Congress leader Dinar Tarcar, surround it. The place was already a mess when the villagers discovered that a fifth mine had started operating right at their doorstep. This mine, operated by one Shaikh Salim, had made a huge hole in a hill, which had five natural springs, including two seasonal springs. Shaikh Salim took the supply of the spring water by laying underground pipes. Huge mining dumps blocked the drains which used to supply water to the village. When the villagers detected this in January 2011. Abhijit provided them the leadership and galvanised the Caurem Adivasi Bachao Samiti. Letters were shot off to all the relevant authorities. A group of villagers even met Chief MinisterDigambar Kamat in early February to stop illegal mining in their area. Kamat gave them an assurance, but nothing happened for the next 15 days. Finally, on 1 March, the adivasis went with Prabhudesai to the Directorate of Mines and asked Director Arvind D Loliyakar to give them written orders to close the mining operations of Shaikh Salim. The adivasis, most of them belonging to the tribe of Velips, thronged the office at 10 am. Half of them, including women, sat outside the office. And the rest enacted a dharna inside the director's office. They did not let the director move out of his room or office. The drama went on for 12 hours and finally the director gave in at 10.30 pm in the night. He issued written orders, asking Shaikh Salim to withdraw all mining machinery and equipment from the lease area by the end of 2 March. He also directed Salim to close all operations on the lease. He promised the adivasis that his department would begin the process of cancelling the mining lease. Shaikh Salim is a legal hair of Xec Mohammad Issac, who was given the mines as 'title concession' by the Portuguese. The villagers went back with the written order. The mining stopped, but the miners did not move the mining machinery. Instead, Salim posted bouncers outside the mine to intimidate villagers. And he went to court to claim back his lease rights. The fight is still on. And Prabhudesai is helping the villagers.